Craving a crusty French loaf? Look no further than this easy baguette recipe. Only 4 ingredients and it’s mostly down time! You can do this! Hey there! Welcome to a new week! I hope you had a fun and restful weekend. Here at my house, I’ve been knee deep in bread baking. I’m on a real kick! In the last few weeks I’ve shared cornbread and soft whole wheat bread, and I’ve also got a fantastic soft pretzel recipe that you’ve gotta try. It would be perfect for Superbowl Sunday! But today’s recipe has always kinda haunted me. My family loves a good crusty French baguette. We eat this kind of bread with so many things! It’s so chewy and yeasty and good. But I’ve always been afraid to try making it myself. Everything you hear says it’s complicated and fussy, and no one but a French boulanger could ever get it right. WRONG! Here’s living proof that anyone can make a killer baguette. You see that? Is that gorgeous or what. I made that! It was actually pretty easy! And I’m not even an expert bread baker (talk to me about cakes though!). I am over the moon about that crunchy, splintery outer crust. See how it shatters? And the interior- soft, pillowy and so airy. It’s perfection. If I can do this, so can you. Don’t let anybody tell you otherwise! When you picture a scene in France, do you envision a girl in a striped top, wearing a beret, and riding a bicycle with a basket full of long loaves of French bread? 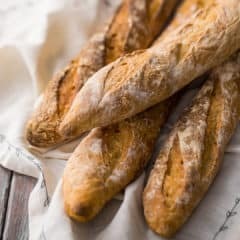 Those long loaves are called “baguettes.” (The term comes from the Latin word for “stick.”) They are iconic, and France’s reputation for incredibly crusty and delicious baguettes is known far and wide. They say that nothing can come close the bread you can get in France. I’ve never been, so I can’t say for sure, but I think you’d stand the best possible chance if you make it yourself. I mean, how could anything be better than a freshly baked loaf of bread? That crackly crust, the tender, airy crumb inside, steamy and yeasty and just begging to be torn into! Give it a try. It’ll only take 4 simple ingredients and a few easy steps. In fact, it’s mostly down time! This recipe has just 4 ingredients: water, yeast, flour, and salt. But the results are magical. And it’s all because of the technique! Start by dissolving the yeast in warm water. While that is doing its magic, combine the flour and salt. Create a little well in the center, and add in the yeast. Stir it around, taking flour from the outside edge and bringing it into the well, a little at a time. Next add in a bit of cool water. Keep stirring, and adding water as needed, until a shaggy dough forms. Now just cover it loosely, and let it rest. For this type of bread, there’s not a lot of kneading involved. It only needs a few quick folds, to become smooth and build strength, without overworking the gluten and causing toughness. Place the dough into a greased bowl and cover it tightly. Allow it to proof (or rise) in a warm place until doubled in bulk. Divide the dough into 4 equal portions, and shape into long logs (about 15 inches long) with pointed ends. Nestle the loaves in to a floured kitchen towel, cover with oiled plastic wrap, and allow to rise a second time. While the baguettes are rising, fill a baking pan with water and place it in the bottom of your oven. Preheat the oven and allow it to fill with steam from the water. This is the KEY to a crusty baguette. Once the loaves have finished their second rise, remove the plastic wrap and sprinkle them with a little flour. Then quickly slash them with a lame, razor blade, or sharp knife. This is decorative, but it also allows the crust to crack and the bread to expand in a more controlled way. Place them in the oven and let them bake until deeply golden brown. They should feel light and dry on the outside, and when you tap them they should give a hollow sound. This type of loaf is infinitely versatile! Slice it into 1/2-inch rounds and it’s perfect as a base for bruschetta or crostini. Or it can be used as a dipper for your favorite party dip. And we love it toasted with garlic butter, for garlic bread. So good with a pasta dinner! Or just tear into it and eat it with a hot bowl of soup. So satisfying! 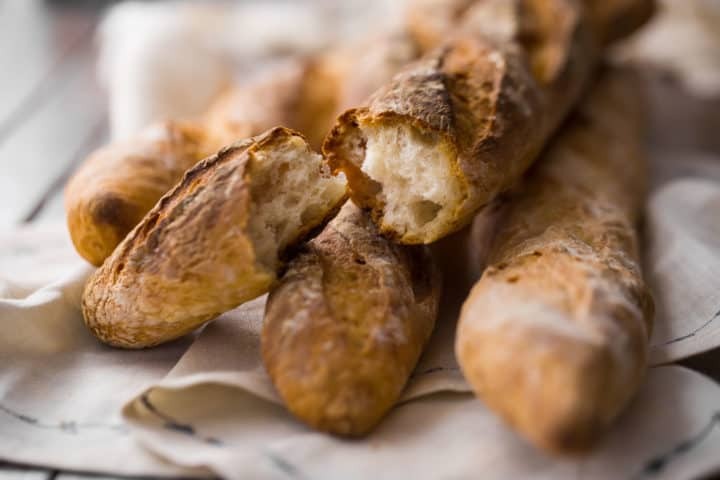 Baguettes are best when they’re freshly baked, but they’re still pretty darn great after a few days! 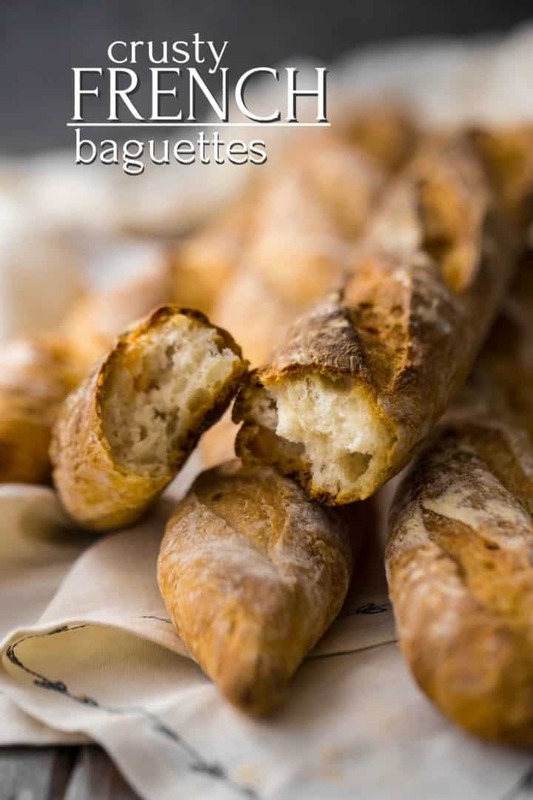 To store a French baguette, just wrap it loosely and keep it at room temperature for 2 to 3 days. If you notice it’s not as crusty after a while, just pop it in a warm oven (around 170 degrees-ish) for 5 or 10 minutes, and it should come out good as new. CAN YOU FREEZE A BAGUETTE? A fancy French boulanger might not agree with me on this one, but I say go for it! I do this a lot at my house. When the baguette is still fresh, slice it down into thin rounds. I’ll often cut on the diagonal so there is more surface area to spread yummy things on. Then just slip the baguette slices into a zip-top freezer bag, and into the freezer they all go. Whenever we want a slice of crusty French bread, we just pull out what we need. The baguette slices thaw in just a few minutes at room temp. Or they can be warmed in the oven or toasted up. It’s super convenient! Hopefully this takes the mystery out of the crusty French baguette! It’s definitely something you can do yourself, so don’t let anyone intimidate you! You’ll love the result and everyone will be so impressed! Craving a crusty French loaf? 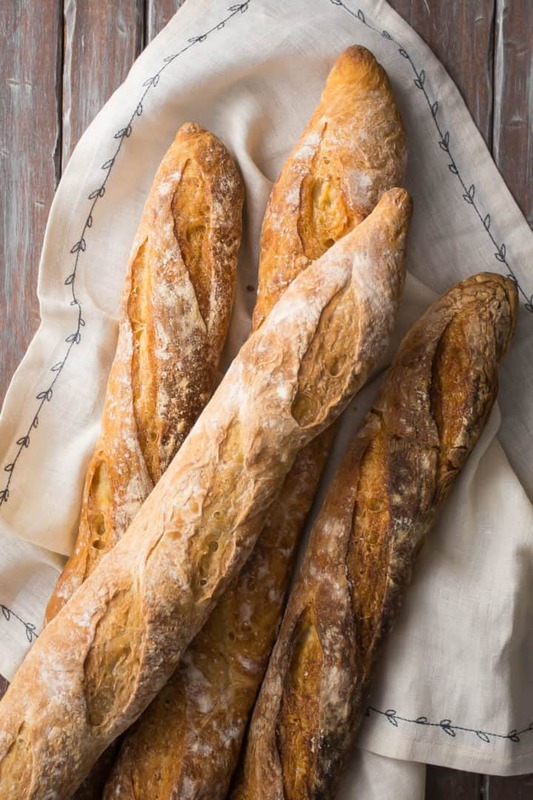 Look no further than this easy baguette recipe. Only 4 ingredients and it's mostly down time! You can do this! Measure the warm water in a small bowl and sprinkle the yeast on top. Set aside. Measure the bread flour into a large bowl and stir in the salt. Make a well in the center of the flour mixture, and stir in the dissolved yeast. Add the cool water, a little at a time, while stirring. When a shaggy dough has formed, cover the bowl with plastic wrap and allow it to rest for 30 minutes. Transfer the dough to a lightly floured work surface, and gently press it into a rectangle and fold into thirds. Turn 90 degrees and repeat. Place the dough in a large oiled bowl, and cover with plastic wrap. Allow it to rise in a warm place for 1 to 2 hours, or until doubled in bulk. Divide the dough into 4 equal portions, and shape each one into a long loaf (about 15-inches long and 1 1/2-inches in diameter), with pointed ends. Place the loaves on a floured towel, cover with oiled plastic wrap, and allow to rise for 30 to 45 minutes. Preheat the oven to 480 degrees F, and place a pan of water on the bottom rack. Uncover the baguettes and transfer to lightly greased baking sheets. Sprinkle with flour, and make 4 elongated slashes down each one with a lame, razor, or sharp knife. Slightly adapted from the book "One Dough, Ten Breads" by Sarah Black. Ms. Black recommends measuring many of the ingredients for this recipe by weight, because it's more accurate. 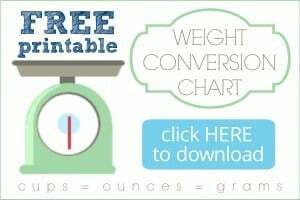 Here is a link to the kitchen scale I use: Digital Kitchen Scale. This recipe can also be made into dinner rolls. Click here for more info: Stenciled Bread Rolls. Nothing better than the perfect French baguette! Thanks so much for sharing this recipe! My mom was taught to make bread by a French chef and he made a well in his flour just like in your recipe. I had to try your baguettes. This bread was marvelous!!! Hooray! So happy to hear it! This French baguette looks so perfect! So easy to make! tried it but dough didn’t rise 🙁 I used instant yeast is that the problem maybe ? Yes you want to use active dry yeast, not instant yeast. Sorry you didn’t have better luck. Can I make this through step 9 and leave the dough loaves on the floured towel for a more extended period of time (6 hours or so) until I’m ready to bake them so we can eat them fresh from the oven at dinner time? You can do that but only if you refrigerate them to slow the growth of the yeast. Otherwise they’ll be overproofed and flat 🙁 Just allow them to come back up to room temperature and then give them the 30-45 minute rise they need, before baking them off. Good luck! How long do you let the yeast proof for?? Just until foamy- usually takes about 5 minutes. This recipe turned out fantastic! I didn’t have bread flour or instant dry yeast, but I used all-purpose flour and mixed instant yeast with the flour instead of in water. Otherwise I followed the rest of the directions and I am so so happy with how they turned out. I’m so happy to hear that Julianna! You’re very welcome!